This article was written by Louise Dendy, published on 22nd May 2012 and has been read 11307 times. Okay, the JET programme sounds great! What do I need to apply? That’s fine, but I don’t speak Japanese. Is that okay? I like the sound of being an assistant teacher, but I’ve never taught before. That’s all well and good, but tell me about the money! Ok, I’m convinced. When should I apply? (Fast forward a few months…) Yay, I got the job! Is there anything I should know before I leave? Anything you’d wished you’d known before you left? 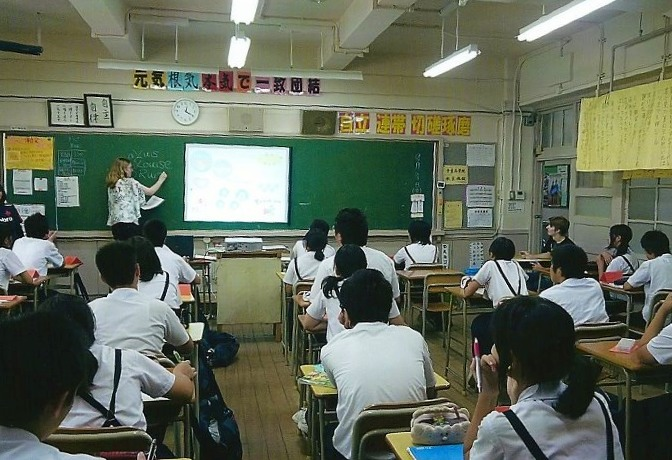 I’m Louise, and I’m an ALT (Assistant Language Teacher) in Kobe, near the end of my first year on the JET programme. The JET (Japan Exchange and Teaching) Programme is a scheme where people up to the age of 40 from English speaking countries all around the world live in Japan and work as either Coordinators for International Relations (CIRs) or assistant English teachers. CIRs work mainly in an office environment doing tasks such as translation and event planning, whereas ALTs (Assistant Language Teachers) work at Elementary, Junior High and Senior High schools all around the country. I studied French, Spanish and Japanese at uni and wanted to carry on learning one of the three. I fell in love with Japan during my year abroad and was determined to go back! (I spent 5 months in Santiago de Compostela, Spain, 5 months in Tokyo, and 1 month in Tours, France.) Actually, I had a job offer to work in a French university as a language assistant but turned it down to come to Japan instead. Applying to JET was the best decision I’ve ever made! Kobe is a bustling city so I’m never short of something to do or people to talk to. Kobe has over 100 ALTs so I have also made a lot of international friends during my relatively short time here. However the beauty of the JET programme is its variety; if city life isn’t something that appeals to you and you would rather get the “full immersion” Japanese experience, you can apply to live and teach in the countryside. You are guaranteed to be the talk of the village as the only resident foreigner! I spend 4 days a week teaching at Junior High School (11-15 year olds) and one day a week at Elementary school (5-10 year olds), and it’s a fantastic job with wonderful kids. In my particular job I take more of a back seat at Junior High, perhaps doing a 10 minute warm-up or some other short activity per 50 minute class. I also take part in English club activities to help with pronunciation and teach them about British culture. In Elementary school I plan every lesson (of 45 mins) and am the main teacher. Again, though, every situation is different. On the JET programme, you’re never sure of what your exact role will be until you’re actually in it! Without a doubt! As I had already learned Japanese at university I had a pretty good base, but since coming back my Japanese has come on leaps and bounds. I can now confidently call to have my packages redelivered, which is a big step forward from dying in summer heat for 3 weeks because I was too scared to call up and get my air conditioner fixed! Firstly, you need to have a degree, in any discipline, by the time you get to Japan. (This means that you can apply in your final year of university.) Secondly, you need tons of enthusiasm about Japan and interest in Japanese culture. And of course, if you want to be an ALT, you need to like kids! I recommend taking a look at the Aspiring JETs section of the JET programme website to find all the info you’ll need. If you want to be a Coordinator for International Relations, you need to have a good command of Japanese (i.e. to have reached level N2 on the Japanese Language Proficiency test or equivalent). For assistant teachers, all you need is a willingness to learn and communicate. Don’t worry, neither had I! Being an assistant teacher means that you don’t have to teach classes alone. Your job is to team teach with qualified teachers, so there’s always someone else there in case something goes wrong! As of 2012, first year JETs will receive around 3.36 million yen, rising to 3.6 in the second year, 3.9 in the third year, and 3.96 if you decide to stay for a fourth or fifth year. The salary for CIRs and ALTs is the same. At the current exchange rate, 3.36 million yen equates to just under £27,000, which is more than enough to live comfortably and send some back home to save, too. You are also entitled to 20 days’ paid leave- you still have to work during school holidays! The application period is from mid October to late November every year. As always, the earlier you can submit your application, the better! If you are successful you will find out around April, and will arrive in Japan in late July to early August. Bring winter and summer clothes, and bring more than one suit! I learned this the hard way… If you are anything larger than a small to medium, you’ll most likely have problems finding clothes that fit. Also, shoes can be a problem. I am a UK size 7, which works out at 25.5cm- and most ladies’ shoes are 25cm max. The most important thing to bring, though, is an open mind and a willingness to throw yourself into new, possibly nerve-wracking situations. Just go with it and you’ll be fine! In conclusion, if you’re interested in Japan and Japanese culture and like the sound of living and working here, you should definitely apply! It’s a great chance to find out about Japan from the inside and not just as a tourist. Also, teaching in such a different culture is challenging, interesting and really rewarding. You won’t regret it! If you have any questions, check out the 'Ins and outs of the JET Programme'. What are my options with regards to Mobile Phones when I go to Spain?